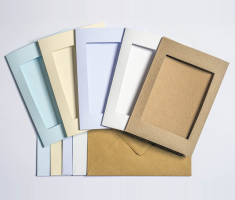 Each of these recycled aperture cards measures 172 x 126mm (7 x 5in) when folded, with an aperture size of 123 x 90mm (5 x 3.5in) set centrally so the cards can be used landscape or portrait. The paper is a solid 300gsm, so will hold your stitching firmly in place. This is a pack of 5 kraft (buff) cards and kraft (buff) envelopes.